Sometimes you know a lot about the genesis of pharmaceutical impurities, and in some cases you know very little. 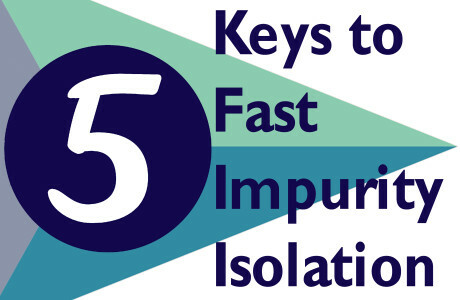 In either case, here are some things that you can try to make impurity isolation faster and improve the chances of success. Whether from stress degradation, mother liquor, extraction, or chromatography; starting with an enriched sample helps reduce timelines in processing the feedstock for isolation. Do solvents, buffers, heat, or light make the impurity appear or disappear? Knowing these answers can guide selection of isolation methods and ensure that your target can be captured and recovered successfully. A robust HPLC method with a stable relative retention times is a must-have. This gives you confidence, allowing rapid set up of new methods and easy reproduction of analyses. You’ll never have to wonder if you’re chasing the right target. Use extraction, precipitation, degradation techniques, as well as different chromatographies and detectors, to get as much information as you can about the target. Every approach yields unique information – and suggests new strategies – for isolation and structure. Answers materialize rapidly when you start with more ideas. A brainstorming collaboration between chemistry teams, analysts, and CROs/CMOs can solve a problem much faster. A different point of view can pull an answer from a (seemingly) insignificant result or observation. For more information on ways Averica can help with Impurity Isolation, or contribute to the method development and analytical understanding of your impurity, contact us. Want more tips? Check out – 5 Ways to Prevent Impurity Isolation Scope Creep.